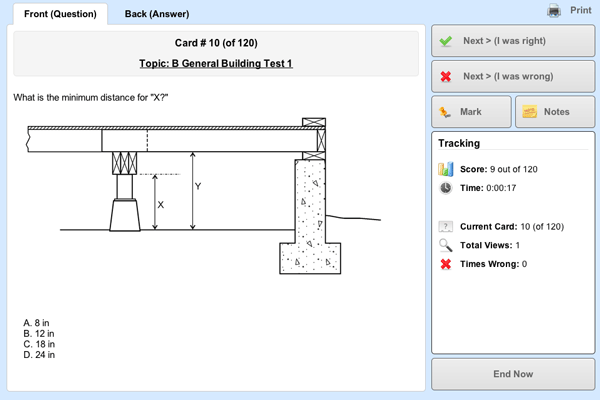 Flash Cards allow students to easily study by viewing the questions and answers while keeping track on their progress. Students can mark if thier answer was either correct, wrong or an option to review it for later. After completing the flash cards, students have multiple study options. They can view Flash Cards not yet seen, those answered wrong, marked to review again or all the questions. Students have access to a timed exam that presents questions in a strict exam simulation. They can choose from multiple choice options and progress through the test just like the actual Certification Exam. After taking the online Practice Exam, students receive a detailed report that lists their score and each question they answered incorrectly, along with the correct answer choice. Provide Each Student with the Best Quality, Low Cost, Up-to-Date Study Materials and Personal Attention, to ensure their successful course completion and obtaining Professional License or Certification of their Choice. Freedom Business School have received exellent feedback on our Building Inspector Certification courses. Our Students enjoy one of the highest exam pass rates in the industry.